The new Pixel and Pixel XL are high-end Android phones made by Google, which are comparable to the hottest Samsung Galaxy S9/S9+ and iPhone X/8 Plus. However, data loss always happens and Google Pixel phone is not an exception. It is possible that you might lose your Pixel data such as photos, contacts and WhatsApp chats because of accidental deletion, factory reset, Android system upgrade, device rooting, or even phone broken, lost or stolen. Have no idea of how to recover deleted data on Google Pixel/XL? Just refer to the following two methods. You can back up photos, contacts, apps and settings from your Pixel phone to your Google Account. Once in the case of data loss, you can restore your backed-up information to your Pixel phone. Please connect your Pixel/XL phone to a Wi-Fi or mobile network, and follow steps below to recover data from Google Pixel. Go to “Settings” and tap “Reset” to reset your Pixel phone, then follow the on-screen steps. When you see “Copy apps & data”, tap “Next” > “Can’t use old phone” > under “Copy another way”, tap OK > “A backup from the cloud”, then sign in with your Google Account that has the backup of your data. Choose a backup and select the file types you’d like to restore, then tap “Restore” to recover data from Google Pixel phone. Tip: You can find photos and videos in your Pixel’s Google Photos app after adding your account. If you’ve saved your contacts to your Google Account, they’ll sync automatically. Step 1: Run Android Data Recovery Software on the computer, choose the files you want to recover. Tap “Next” to connect your Pixel phone to PC via a USB cable, then let our program to identify your device. Step 2: Once connected, tap “Start” to scan the lost data from Pixel phone. The time cost on scanning depends on the memory storage of your Pixel/XL phone. Step 3: After previewing the scanned data, select the file types you need, then click “Recover” to recover deleted files from Google Pixel. Restoring Pixel from Google Backup is convenient and you don’t have to install any third-party software. However, it is only for devices running Android 8.0 or later, and you are not able to preview the backup files. What’s more, it is only workable on the condition that you’ve backed up data to Google account. 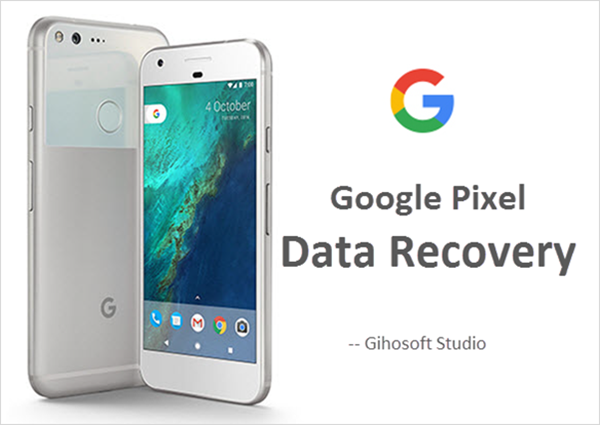 If you accidentally lose data on your Google Pixel phone with no backup available, the best choice to recover data from Google Pixel may be using Gihosoft Android Data Recovery, which lets you preview the lost files and recover those you want only. 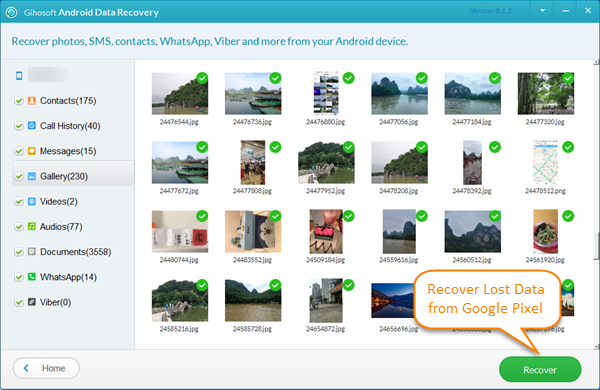 Apart from Google Pixel, this freeware can also recover deleted data from Samsung Galaxy S9/S8, Google Nexus 6P/5X, HTC U11/U11+, LG V30, OnePlus 5/5T, Sony, Motorola, Huawei, ZTE, etc. To avoid any future data loss, you’d better make a backup of your Google Pixel, for example, back up with your Google account. An alternative way is using third-party tool like Gihosoft Mobile Phone Transfer, which not only permits you to backup contacts, text messages, call logs, photos, videos, music and more on Google Pixel to the computer, but also allows you to restore previous backup files to any Android or iOS devices whenever you need.